As a part of ancient Japanese culture, the limbless Daruma doll has withstood the test of time and continues to be a popular symbol of determination and focus on a goal. Daruma dolls are believed to be patterned after the deeply religious Bodhidharma; known as the founder of Zen, who lost the use of his limbs from sitting too long in prayer. One of the endearing qualities of the roly-poly Japanese Daruma doll is the ability to raise itself upright, even when it is pushed down. This "never gives up" quality of the doll is a great message of resilience and strength in the face of adversity. Usually made with both eyes left blank, the owner of the Japanese Daruma doll will make a wish or state a goal before coloring in one pupil (usually the right) and completing the left side when the wish comes true. The doll are usually red, but are made in black and other colors as well. 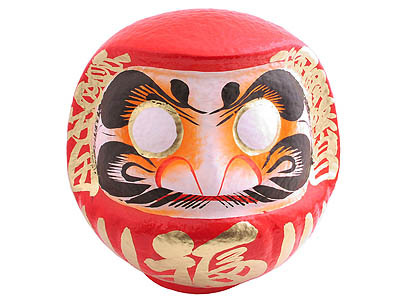 Often purchased for the beginning of a new venture, Daruma dolls are readily visible in most businesses and homes and are a popular Japanese symbol of good luck. In Japan, they are often presented to politicians for wishes of victory, and new businesses also display these dolls with hopes for prosperity.